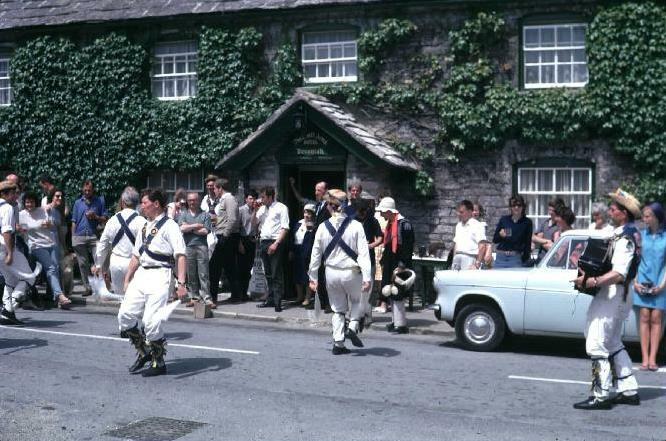 The Thames Valley Morris Men took over the ‘Square’ outside the Scott Arms one afternoon in July 1968 and treated onlookers to a fine display of Morris Dancing. This photo brings back memories of the old Romany Caravan that stood for years outside the Scott Arms before being demolished by a vehicle misjudging the bend! Home-made jam – Miss Joyce, Mrs. A. Cooper, Miss K. Bullen. Plain cake – Mrs. W. Dorey, Mrs. C. Orchard, Mrs. A. Cooper. Fruit cake – Mrs. A. Cooper, Mrs. A. Dorey, Mrs. P. Damer. Jam sandwich – Mrs. A. Cooper, Mrs. W. Dorey. Collection of vegetables for special prize given by Mr. Gibbons – W. Dorey, J. Marsh, P. Damer. The annual ball at Encombe House was given on New Year’s Day. A goodly company sat down to a most sumptuous supper. The Mayor of Corfe Castle presided. Various toasts were proposed and appropriately responded to. The Kingston Band was in attendance. Mr. Gillman sang several comic songs, which gave much pleasure. Votes of thanks were accorded to Mr. Rich and Mrs. Burt. The enjoyment was continued till a late hour.